From Yogic perspective all women are the Goddess. Here I have taken a Yogini who loves Kali and morphed her into Kali, the ferocious mother goddess. 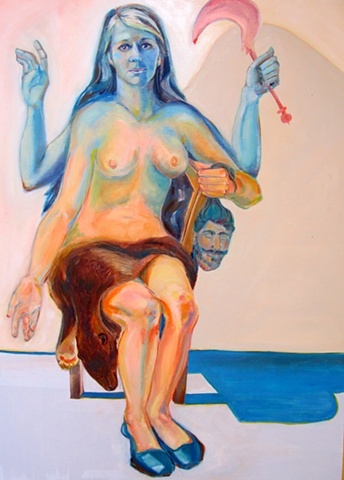 She holds her sythe to cut off the head of ego attachment and dispels blessing with her right hands. I painted this with a nod to the painter, Wayne Theiboud, and his Girl in Blue Shoes.